By now most modelers use some variety of ACC cement to assemble multimedia kits or attach items like brass or resin to older kits. But use of those cements can be tricky as some have relatively thick (high viscosity) compositions and are easily placed on the object; others, usually “hotter” (e.g. faster drying) ones are low viscosity and very difficult to get both in place and in the proper amount. The most difficult one I have which I use is a brand called “Dr. Mike’s” which is nearly impossible to use straight from the bottle. A number of techniques are available such as fine pointed tips or extension tubes, but the root problem is still how quickly the cement runs out and where it goes once out of the bottle. Using a dauber such as a toothpick from a puddle may help but this usually doesn’t carry enough low viscosity cement to get the job done. Analyzing the problem, Creative Dynamic has created a perfect tool for the purpose – the Glue Looper. What it consists of is one of three different size loops at the end of a highly modified craft knife blade attachment that uses surface tension to carry a more useful amount of low viscosity cement to where it is needed. At the AMPS 2015 show this year CD owner Ken Alfter and his partner Ann were on hand and demonstrate the tool in action. She would pour out a small amount of ACC on a scrap of styrene, dip the Looper in the cement and then touch it to where it was needed; if it was a seam between plastic or other parts once touched it would break the surface tension and the ACC would flow down the seam, sealing it nearly immediately. While I suspect it will still be difficult to attach very small etched metal parts with this method (not enough “footprint” on the part) it is a very neat and handy way to attach nearly everything else. To clean the tool Ann simply picked up your basic rock-concert-quality BIC lighter and burned the tip clean. 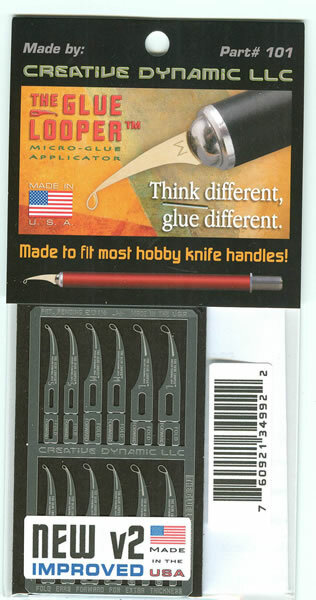 The tips are all made of what appears to be etched stainless steel and are quite thin; for proper seating in a craft knife handle they have a doubler at the back which folds over so the handle can properly grip the tool. CD also offers a bespoke craft knife handle for $5.00; this is a padded handle with a rear adjustment locking knob that looks to be quite comfortable for use as a general purpose craft knife as well. They also recommend Mercury Adhesives M5T ACC cement which they also offer for $3.50 for a 10 cc bottle. Overall this is a really nice idea and one I am going to be happy to use to deal with fussy parts in the future! Thanks to Ken and Ann for the review samples.